What Does The Word ‘Seek’ Mean In Hebrew and Greek? Multiple times in the Bible, it tells us to seek various things. Seek God, His righteousness, peace, His face; all sorts of stuff. Curiosity overcame me and I wanted to know: what does the word seek actually mean? Seeking God is something I long to do, but how can I achieve that? I became determined to study the word seek and get a deeper understand of its meaning. There’s a bunch of words in Hebrew that are used to describe the word seek. I think the easiest way to lay out this information would be to give the words, then define what they mean. It’ll help us to get an all around feel of what these words mean. All of the definitions are taken from the Strong’s Expanded Dictionary of Bible Words. Click here to order now! Are there any goals you have in your life right now? Goal setting is extremely important. They motivate you to keep pushing when you would normally quit. Make a goal that you will seek God and find out more about Him. Aim to have an intimate relationship with Him and don’t settle for anything less. The last part of this definition warms my soul. Everyone can relate to caring for somebody deeply. Our passion runs so deep for them. We care about their well-being and want to know how they are feeling. It makes us happy to offer favors to them. It’s just like the dating stage, but it’s combined with being devoted. To devote to something means give ourselves up entirely to it. When we become married, the father says to the groom, “I give the bride away to you.” From that day forward, it’s no longer about ‘me’, but about ‘us’. The Bible says that we become one flesh. We’re one unit that has to work together and consider one another’s needs and wants. It’s no easy task, but it’s well worth it. Hence, seeking God by this definition means to have a married, dating relationship with Him. He loves you and adores you very much. Can you remember the last time you spent romantic time with Him by worshiping Him and expressing the amount of trust you have in Him? He is the bridegroom, after all. Frequently, it’s used to mean, “inquire of God.” It can mean privately seeking God in prayer, or contacting a prophet who would contact God for them. However, darash can be used to describe inquiring of a spirit that is not God. For instance, King Saul went to ‘inquire of’ the medium. The prophets used this word when telling others to seek the LORD. My conclusion is that the Hebrew words for ‘seek’ (in reference of seeking God) mean ‘to go after, chase down, search for, ask, or consult.’ If you want want to seek God, make Him a priority and don’t stop chasing after Him even when you feel satisfied. anazeteo- to seek carefully and diligently. Used when searching for a human being, implies difficulty in the effort. Anazeteo is used to describe the kind of search Joseph and Mary endured when they lost Jesus (see Luke 2:43-44). 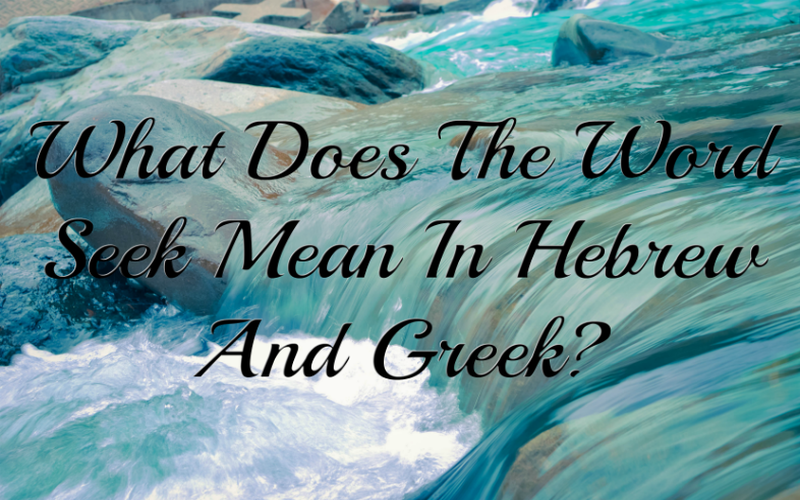 These terms for seek in the Greek language are similar to the definitions we found in the Hebrew. I hope this was helpful. Feel free to request any words you want me to break down with you. I read your Scripture Rhema of G-d’s word. It is Gadol. Please give the “break down” of the Hebrew word “Rear Guard”..Isa. 58:8. When I read “The Word” I take it as Rhema. I no longer wait.